Queen duvet cover (88" x 88") featuring the image "Gibbys Restaurant In Old Montreal" by Carole Spandau. Our soft microfiber duvet covers are hand sewn and include a hidden zipper for easy washing and assembly. Your selected image is printed on the top surface with a soft white surface underneath. All duvet covers are machine washable with cold water and a mild detergent. Many thanks to the buyer who purchased a couple of my prints last night...hope you.enjoy this one! it was fun to paint! 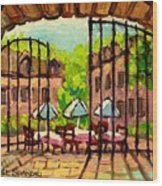 Thank you Marwan and Lois, Gibbys is a famous restaurant, located in the old part of Montreal, where stables used to be..; People love the steaks so much, they come from all over the world just to enjoy a meal there. 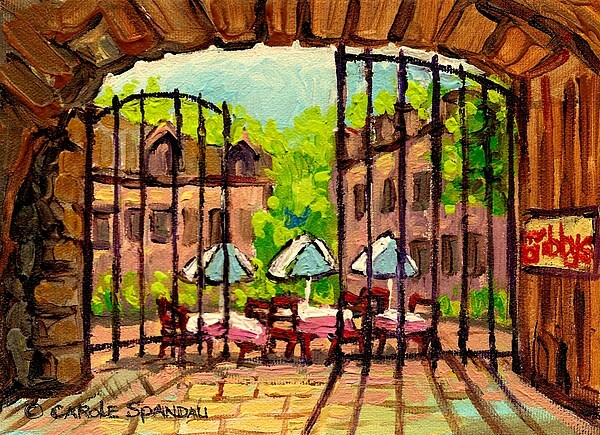 I chose to paint the inviting courtyard, with the gate half open......and the courtyard terrace beckoning from within. fabulous framing ... love the leading lines created by the shadows ... soooo inviting ... I want to walk right through the gates and enjoy the beautiful spring sun beyond!!!!! Carole, sweet! This is a very inviting painting. 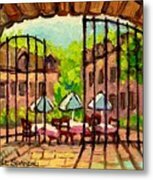 Many times I've passed these gates, but never actually been to Gibby's.. this is a great painting of it though.. exactly how it looks as one gazes through those large gates..Carole, you have a great eye for the detail on these places around the city that have become landmarks over the years.. I love this one.. it is so inviting and pleasant!! Your colors have created a wonderful, welcoming atmosphere..
Lovely place! Great work, Carole! I ate here once. Is it still here? Nice work.It has a relaxed casual feeling. 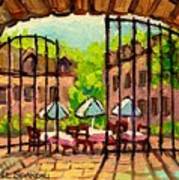 Happy Summer Carole!